The DAI published the following statement regarding the DeVeydt Family: “A beautifully unique family brought together by love and commitment to one another, the DeVeydts share DAI’s belief that adoption isn’t a one-time transaction but a lifelong transformation. They are the kind of strong family that DAI is all about. We are privileged to recognize them with DAI’s first ever Modern Family award.” Click here for the DAI’s tribute to the DeVeydt family and to other honorees at this year’s Taste of Spring event. 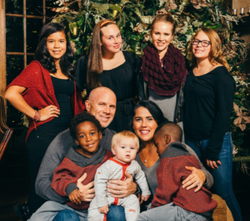 Michele Jackson has worked as an adoption attorney and advocate for over 16 years. She is the founder of MLJ Adoptions, which provides services for adoption. She and her husband, Wayne DeVeydt, are the founders of the Global Orphan Foundation. The Global Orphan Foundation provides care, resources, and advocacy for orphaned children here in the United States and throughout the world.